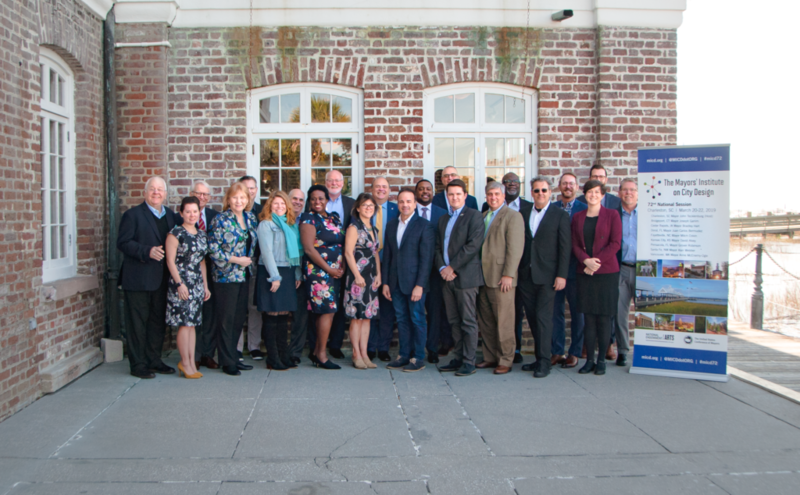 MARCH 2019 – CHARLESTON – The 72nd National Session of the Mayors’ Institute on City Design (MICD) took place in Charleston, SC from March 20-22, 2019, hosted by Mayor John Tecklenburg. Seven experts in architecture, landscape architecture, urban planning, economic development, transportation, real estate development, and urban design joined a group of eight mayors for two and a half days of discussions, offering pragmatic advice on how the mayors could approach the design and development challenges facing each of their cities. At the forefront of the discussions were concerns about neighborhoods that have been left behind while other areas of the city saw success. The participating mayors hoped to attract new investment and growth to these areas while staying true to the neighborhoods’ unique character and avoiding displacement of current residents. While learning more about the long-term planning required for such multi-faceted success in redevelopment projects, mayors also sought ideas for “quick wins” to demonstrate the city’s commitment and get residents excited about the future, especially in areas with a history of broken promises. Members of the Resource Team, experts who served in a volunteer role on behalf of the nation’s cities, shared a curriculum of cutting-edge ideas and key design principles. The importance of meaningful community engagement came up again and again, illustrated with detailed examples of genuine engagement and robust community-based processes. Resource Team members also stressed that regardless of the city’s organizational structure on paper, the mayor has the power to bring stakeholders together and set the tone, vision, and goals for every important project. The 72nd National Session began with a tour of Charleston that showcased how public realm investments catalyzed private development in the historic downtown, along the waterfront, and beyond. The tour ended at Joseph P. Riley, Jr. Park for the opening reception, where Mayor Tecklenburg, U.S. Conference of Mayors CEO & Executive Director Tom Cochran, National Endowment for the Arts Senior Advisor Tom Simplot, and MICD Executive Director Trinity Simons welcomed participants. Former Charleston Mayor Joseph P. Riley, Jr. opened the session with an inspiring keynote speech about the history of Charleston and a mayor’s role in creating cities where “every citizen’s heart can sing.” Over the two days that followed, mayors learned concrete tactics and gained valuable perspectives on how to make that a reality.